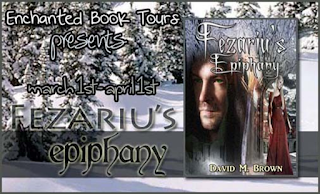 I'm delighted to host David M. Brown, author of Fezariu's Epiphany, on my blog today. I'm currently reading the book and looking forward to posting a review. I'm also currently writing a sequel to my own novel (Divide by Zero, coming from Stonegarden in summer). So the title of David Brown's post seems particularly relevant to me. I hope you'll enjoy reading it as much as I have. 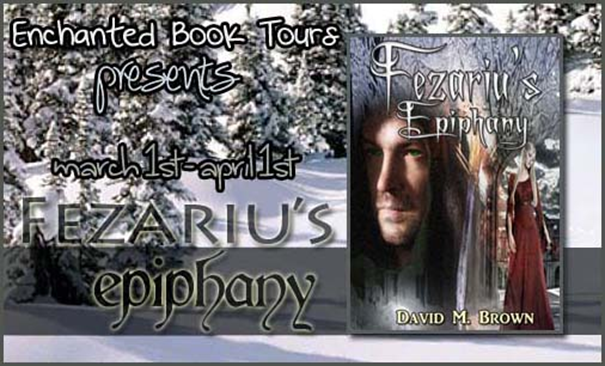 Fezariu's Ephiphany is an epic fantasy tale: 12-year-old Fezariu thought his mother died when he was little, but when his beloved stepfather dies the boy discovers she is alive and well - and working at the most famous brothel in all of Elenchera. When she cruelly rejects him it's more than he can bear, and he runs away to join a band of ruthless soldiers for hire. The Merelax Mercenaries will fight for anyone who can pay them, no matter the justice of the cause. Sounds intriguing... but what about those sequels? Over to you David. When I published Fezariu’s Epiphany back in May 2011, I sometimes found interview questions wanted to explore the possibility of a sequel. I can say for certain that you will never find me writing a follow-up about another epiphany Fezariu has. The Elencheran Chronicles are intended as a series of self-contained novels, a visit for the reader to a different period of history, and a brief amount of time spent in the company of some of the characters. The timeline currently stretches to 47,000 years and may go further when I revisit the world history at some point, so readers are not short of literary destinations for their summer holidays. So, am I saying that sequels are completely taboo? My next novel, A World Apart, will not have a follow-up. It’s a long novel but by the end there have been enough resolutions to say the story is well and truly over, there isn’t a need for any more from the three main characters – Demetrius, Eleyna and Halcyon. That said the idea of writing a series of novels about the same characters is not one I can readily dismiss, the history of Elenchera simply won’t allow it! Looking through the history I find I have many ideas waiting to be written and it becomes more difficult trying to decide which one will be the third book in the Elencheran Chronicles. Some events in the history are so action-packed and stretch across a vast range of years that one novel may not be enough to contain them all. I think inevitably sequels will be necessary, perhaps a trilogy, but no more than that, I simply can’t commit to that many books. When I first started writing about the world of Elenchera I knew that I wouldn’t and couldn’t write a series like Robert Jordan’s The Wheel of Time or Terry Goodkind’s The Sword of Truth. I never got into Jordan’s work despite completing the first Wheel of Time book but I read every one of Richard and Kahlan’s adventures in The Sword of Truth series. Goodkind did very well to sustain those characters through one long and continuous narrative but I did find the later instalments inferior to the earlier books. I didn’t want to go down that same path. I love my characters but the thought of spending half a dozen books with them is not an appealing one. I would strangle them before their stories were finished! This is one of the reasons I am drawn towards Terry Pratchett’s Discworld series. They’re always in the same world but they are self-contained novels and feature a wide range of characters, always plenty of variety. Although regulars like Rincewind, Death and the Guards of Ankh Morpork would request that you read their books in order I don’t always think it’s essential. Elenchera will be just the same. If you saw a pile of books about Elenchera you could pick any of them up and not be missing anything. When I come to write those longer novels I will have to commit to a maximum of three books to tell the story but no more than that. I’d rather have just one novel to tell a story but some are such long narratives I fear they could stretch to 2,000 pages which is an epic book for any reader, it would even put War and Peace to shame. I’ve seen many people roll their eyes at the mention of Tolstoy. I don’t want that to happen to me! My aversion to sequels means that some much-loved characters may only get a brief time in the spotlight but although that saddens me to a degree I think it’s also a mark of great characters if readers can get attached to them after knowing them for only a short time. The more I focus on self-contained novels, the more of Elenchera I can show you. There is a lot that goes on in those 47,000 years, certainly more than I can tell you in a lifetime but I will endeavour to whisper as many secrets as I can. Just remember that if a novel of mine does not end on a cliff hanger then the chances are you won’t be getting a follow-up. Thank you so much for allowing me to appear on your blog today, Sheila! I appreciate the chance to share my aversion! Thank you David. I've actually found time to work on my sequel today, so I'm feeling less negative about them, temporarily.